The latest addition to my website is Stefan Andres‘ Wir sind Utopia (UK: We Are Utopia; US: We are God’s Utopia). 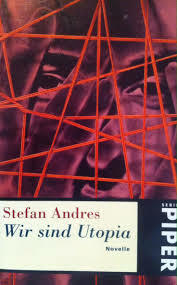 This is a short novel but a very fine one and Andres’ best-known novel. It was published illegally in Germany in 1942, while Andres and his wife were living in Italy. It takes place in the Spanish Ciivil War, in a monastery. The monastery has been converted to a prison, not least because the monks’ cells are suitable for prisoners’ cells. A new intake is brought to the monastery at the beginning of the novel and it turns out that one of them, Paco, used to be a monk there, called Father Consalves. He had had the idea of a utopian society which his superior, Father Damiano, told him was totally unrealistic and, eventually, he had left the monastery and spent much of the rest of his life as a sailor. The lieutenant, Pedro, in command of the prison has a guilty conscience, as he has ordered all the monks killed and now wants absolution and asks Paco to give it. Paco says that, as he is defrocked, he cannot do so so but the lieutenant insists. The two men – one, Pedro, a man who has been unhappy much of his life and is, by his own admittance, a devil and a beast and the other, Paco, a defrocked priest who has lost all hope of finding his utopia – face each other, with death approaching, as the war draws near and we know that the lieutenant will soon be preparing to retreat but he cannot leave all the enemy men to rejoin their army. Death can be the only victor, as Andres must have felt in 1942.